Dysfunctions in brain cholesterol homeostasis have been extensively related to brain disorders. The major elimination pathway of brain cholesterol is its hydroxylation into 24 (S)-hydroxycholesterol by the cholesterol 24- hydroxylase (CYP46A1). Interestingly, there seems to be an association between CYP46A1 and high-order brain functions, in a sense that increased expression of this hydroxylase improves cognition, while a reduction leads to a poor cognitive performance. Moreover, increasing amount of epidemiological, biochemical and molecular evidence, suggests that CYP46A1 has a role in the pathogenesis or progression of neurodegenerative disorders, in which up-regulation of this enzyme is clearly beneficial. However, the mechanisms underlying these effects are poorly understood, which highlights the importance of studies that further explore the role of CYP46A1 in the central nervous system. We will summarize the major findings regarding CYP46A1, and highlight the several recently described pathways modulated by this enzyme from a physiological and pathological perspective, which might account for novel therapeutic strategies for neurodegenerative disorders. Elsa Rodrigues is an Assistant Professor at Faculty of Pharmacy, Universidade de Lisboa (iMed.ULisboa-FFUL). She holds a degree in Biology and a PhD in Molecular Biology. During her Doctoral studies at Maria Celeste Lechner’s lab at the FFUL in collaboration with Patrick Maurel (Unité INSERM 128), she elucidated mechanisms involved in gene regulation of liver-specific Cytochrome P450 genes. 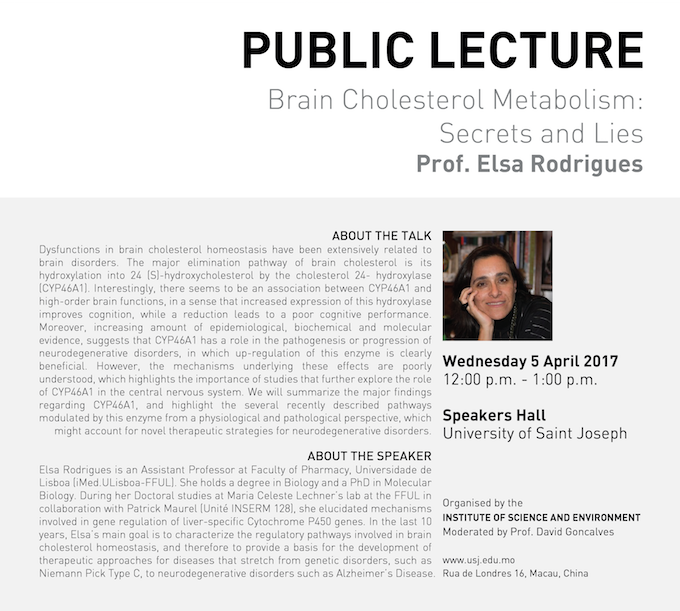 In the last 10 years, Elsa’s main goal is to characterize the regulatory pathways involved in brain cholesterol homeostasis, and therefore to provide a basis for the development of therapeutic approaches for diseases that stretch from genetic disorders, such as Niemann Pick Type C, to neurodegenerative disorders such as Alzheimer’s Disease. Her focus has been on the potential beneficial modulation of cholesterol homeostasis through ectopic expression or pharmacological up-regulation/activation of the neuronal specific cholesterol 24-hydroxylase encoded by the cytochrome P450 CYP46A1 gene.